I have a numbered limited edition lithograph (poster) that my brother had bought me. 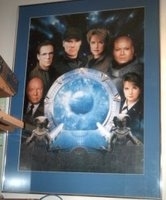 I had Spillers Framing frame it for me.. Looks good.I am looking forward to the upcoming Stargate movie(s). I have watched Dean Anderson as MacGyver I like to think outside the box to make things work or fix things with whatever is laying around. I like the Discovery Channel, HIstory Channel, etc. I like to learn, hate to study. If I can learn at my own pace with no rush I am happy. I am a hands on leaner. Impatient at times which makes it hard to teach others. I like music.90's Pop, Vocal, Orchastra, Smooth Jazz, some country. I like to sing in the car. I like to sing in church. I like to disassemble and assemble things. Hopefully both successfully. I like to complain even though I know that I have little I should complain about. It is easy conversation. Perhaps a social crutch.